The NYPD closed down part of 49th street earlier this evening due debris flying off the building across from the Eugene O'neill. They were not letting anybody into the O'Neill, including ushers. No word yet on whether or not 33 Variations will go on tonight. Cops contacted the Mayor's Office and indicated that the owners of the building, which is under renovation, will be fined $500. Only $500? Surely more than $500 worth of tickets have been sold tonight so don't producers deserve more than that if the show doesn't go on tonight? *Update* The show did go on. 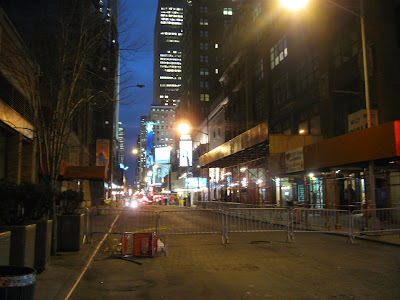 A chatter at talkinbroadway said, "The most dramatic happening was having to enter the Oneill thru back passageways as 49th Street was closed due to a scaffolding collapse across the street."